Increasing farm distress and the resulting farmer suicides are areas that need urgent attention. A key aspect of any suicide prevention strategy is our ability to understand the suicide process and manage the predisposing, protective, and precipitating factors so as to prevent these suicides. Extension services should play a crucial role in preventing farmers’ suicides – by assisting them to fathom the stress and suicide process, identifying vulnerable groups, providing telephonic advice and counseling, and creating community-based institutions that can educate and help farmers, argue P Sethuraman Sivakumar and P Venkatesan here. Despite its substantial presence and contribution to rural livelihoods, Indian agriculture faces several challenges. These include: shrinking size of landholdings, unstable markets, erratic climatic conditions, and a gradual decline in the availability and productivity of natural resources, which has currently led to a distress-like situation, which adversely affect the farmers. Farmers’ suicides (Box 1) are becoming a major socioeconomic issue in India, leading to farmers’ agitations and political debates. Farmers’ suicides result in immeasurable social, psychological, and economic costs to families and rural communities (Lovelock and Cryer 2009). At the family level, farmers’ suicides have caused breaks in children’s education, development of anxiety and stress disorders in family members, reduction in household income in the Vidarbha region of Maharashtra (Kale et al. 2014), and in Punjab it has led to reduction in the size of operational holdings, loss of dairy animals, and significant yield reduction in high value crops (Singh and Singh 2016). Agriculture is considered as a stressful occupation (Keating 1987), operated in complex, diverse and risk-prone environments. It also makes farmers vulnerable to physical, biological, chemical, mechanical, and psychological hazards (Gerrard 1998; Fraser et al. 2005). The National Safety Council, USA, sited agriculture as one of the leading occupations producing high stress among farmers (National Safety Council 2016) while farming was identified as the fourth highest risk occupational group in the UK (Kelly et al. 1995). Studies in the USA (US Dept. of Labor 1999), Canada (Pickett et al. 1999), and Australia (Fragar and Franklin 2000) have identified farming as one of the most dangerous industries (Gerrard 1998; McCurdy and Carroll 2000), and as being associated with high rates of stress (Simkin et al. 1998). 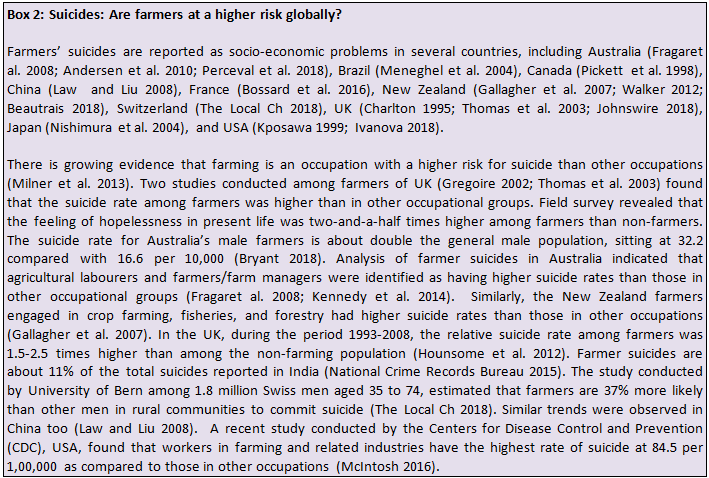 Research studies conducted in several countries indicated that farmers are more vulnerable to stress and other psychological hazards which lead to suicide (Box 2). Multiple Uncertainties – Farmers are subject to the uncertainties of climate and other natural forces, unstable market conditions, changing consumer demands, fluctuating interest rates, and changing global agricultural conditions and policies. Diverse working conditions – Farmers work for long hours in physically demanding environments under a range of varying light and weather conditions (McCurdy and Carroll 2000), with work practices involving high health risks including chronic exposure to pesticides and other chemicals (Von Essen and McCurdy 1998; Rautiainen et al. 2005) along with handling heavy farm machinery. Multiple work roles – Farmers also hold multiple work roles in farms, households and off-farm responsibilities that are performed with limited time, resources and energy. These factors make farmers vulnerable to hazards and mental problems such as high levels of stress (Booth and Lloyd 2000), depression and anxiety (Eisner et al. 1998), diseases like heart and artery disease, hypertension, ulcers, and nervous disorders (Fetsch 2018; Grant et al. 2009), physical injury and suicide (Booth et al. 2000; Page and Fragar 2002). Suicide is the act of intentionally ending one’s own life (Nock et al. 2008), which is essentially an outcome of harmful psychological processes. Suicide is seen as an extreme end to a continuum of psychological stress, distress, and tragedy for individuals, their families and communities (Boulanger et al. 1999). The suicidal process has several interlinked factors and events, such as a pre-disposition to risk or stress factors, onset of stress, poor coping ability of such individuals to manage stress, vulnerability of individuals to psychological hazards, occurrence of precipitating factors which trigger suicidal ideation (thoughts), which then leads to inhibition due to protective factors or suicide guided by facilitating factors. 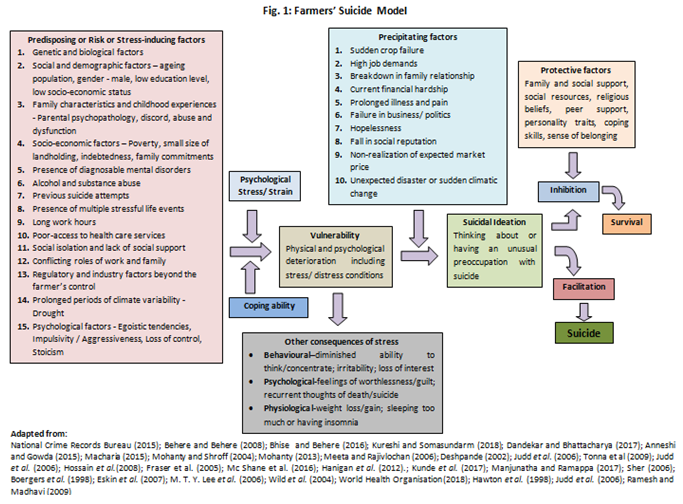 Based on a critical review of studies conducted on farmers’ suicide in different countries, a suicide model is proposed (Figure 1) integrating various predisposing, protective and precipitative factors of farmer suicides into the popular Clinical presentation of suicidal behaviour model (Shaffer and Pfeffer 2001) and the Model of stress, distress, and psychiatric illness (Terluin et al. 2004). The proposed suicide model presents a sequential view of various factors or events leading to a farmer’s suicide. The various suicide factors depicted in the model are compiled from various studies conducted in India and abroad. According to the Farmers Suicide Model (Figure 1), stress is the major reason that makes farmers vulnerable, leading to suicide. Various predisposing factors affect farmers in the long-term and create stress in them. 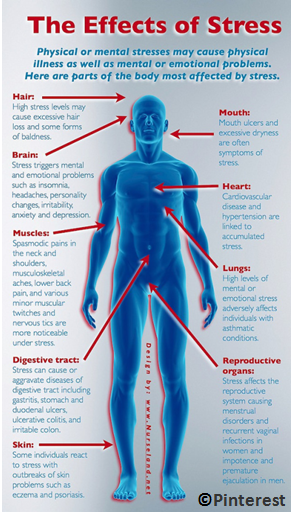 Prolonged stress makes them vulnerable to physical and psychological hazards like depression. The vulnerable group of farmers are affected by unexpected precipitating factors, which influence their decision to commit suicide; it also depends upon the absence of protective factors. Predisposing factors are those conditions or situations that increase the likelihood of farmer suicides. Predisposing factors induce long-term psychological stress in farmers which make them vulnerable to suicide. The predisposing factors associated with farmers’ suicide include: genetic and biological factors, social and demographic factors, family characteristics and childhood experiences, socio-economic factors, presence of diagnosable mental disorders like depression and mood disorders, along with alcohol and substance abuse; psychological factors such as egoistic tendencies, impulsivity/aggressiveness, loss of control/stoicism; previous suicide attempts and presence of multiple stressful life events, long work hours, conflicting roles of work and family, poor access to health care services, social isolation and lack of social support; regulatory and industry factors beyond the farmer’s control; and prolonged periods of climate variability with heat stress and drought (Fig. 1). Precipitating factors are stressful events that can trigger a suicidal crisis in a vulnerable person. These factors cause or trigger the onset of a disorder, illness, accident, or behavioural response. A few precipitating factors which trigger farmers’ suicide are: sudden crop failure, high job demands, breakdown in family relationships, current financial hardship, prolonged illness and pain, failure in business/politics, hopelessness, fall in social reputation, non-realization of expected market price, and unexpected disaster or sudden climatic change (Fig. 1). Protective factors are those that decrease the probability of an outcome in the presence of elevated risk. Some of the protective factors which prevent farmers’ suicides include: family and social support, social resources, religious beliefs, peer support, personality traits, coping skills, and a sense of belonging (Fig 1). The psychological stress refers to the emotional and physiological reactions experienced when an individual confronts a situation in which the demands go beyond their coping resources. It is created due to occurrence of unexpected stressful situations. Distress is an aversive, negative state in which the coping and adaptation processes fail to return an organism to physiological and/or psychological homeostasis (Carstens and Mober 2000). Coping is the sum of cogitive and behavioural response of individuals to stress, which are constantly changing, that aim to handle particular demands, whether internal or external, that are viewed as taxing or demanding (Lazarus and Folkman 1984). Vulnerability refers to the inability of a person to withstand the effects of a hostile environment. It indicates physical and psychological deterioration including stress/distress conditions. Suicidal ideation is thinking about or having an unusual preoccupation with suicide. Hopelessness, mood swings, anxiety, emotional pain and depression are a few symptoms of suicidal ideation. The suicide facilitation factors include easy access to suicide methods, acceptance of suicidal behaviour, isolation, impulse, and evading treatment. Farmers’ suicides are caused by a complex interplay of various factors and occur at different stages of their life. An important aspect in preventing farmers’ suicides is identification of the vulnerable population in advance, and helping them overcome their psychological stress. Suicide risk assessment refers to the establishment of a clinical judgment of suicide risk in the near future, based on the weighing of a very large mass of available clinical detail (Pokorny 1983). Risk assessment is carried out in a systematic, disciplined way by qualified professionals. The assessment of suicide risk is based on identification and appraisal of warning signs, along with predisposing and protective factors that are present. Several methods, instruments and diagnostic tools are developed to assess farmers’ stress factors, coping behaviour, vulnerability to suicide, and suicide ideation. A few resources are available to support the suicide risk assessment process, including clinical guides (Jacobs 1999; Rudd et al.2004) and best practice guidelines (American Psychiatric Association 2003; Heisel and Flett 2006; Registered Nurses’ Association of Ontario 2009). A few suicide risk assessment scales and methods are displayed in Table 2. 12. Psychological or verbal autopsy It is a retrospective reconstruction of the life history of a suicide victim, which involves the examination of physical, psychological and environmental details of the victim’s life in order to more accurately determine the mode of death and get a better knowledge of the death process and the victim’s role in hastening or affecting his own death. Behere and Behere (2008); Bhise and Behere (2016); Gajalakshmi and Peto (1997). The farmers’ suicide risk assessment process involves collecting sensitive information from human subjects and this call for approval from Institute Ethics Committees. It is important to follow the ethical guidelines laid out by the Indian Council of Medical Research (ICMR) (2017) to avoid problems in the future. Many assessment scales are copyrighted and involve costs in procuring and using them. Unauthorised use of assessment scales or other measure will invite legal issues. It is essential for researchers to undergo formal training before conducting a suicide risk assessment. It is a specialised process which needs deeper/sensitive understanding of the entire suicide process. Many suicide risk assessment scales or measures are standardised and have adequate reliability and validity across cultures. The suicide risk assessment is conducted by a psychiatrist, registered psychologists, or people who are adequately trained for this purpose. Indiscriminate use of these measures by unqualified persons will attract legal issues. When a researcher is interested in developing a scale or measure to determine any aspect related to farmers’ suicides, it is essential to study all available measures or scales which have already been standardised. Developing a measure or scale for assessing risk factors of suicide is a complicated process as it requires Ethical Committee approval, and needs to be carried out under the supervision of a psychiatrist or a registered psychologist. This service is aimed at educating farmers about farm stress – its sources, identifying the symptoms, and measures to cope with stress. They provide links to various distress and suicide-related services in the county/state/country. The extension services also conduct campaigns to educate farmers about stress management and suicide prevention. This service provides opportunities for farmers to discuss their farm-related problems, which induce stress, and get advice through telephone or one-to-one counselling. The Iowa Concern programme of Iowa State University Extension and Outreach (https://www.extension.iastate.edu/iowaconcern/) provides stress counselling, telephonic advice on stress-related queries, managing legal issues of farmers and helping them to cope with stress in crisis situations. Here the extension agency voluntarily acts as a third party in solving farm-related disputes outside the legal process. This service greatly reduces the stress involved in conflict resolution among farmers. For example, The Kansas Agricultural Mediation Services of Kansas State University Extension (Web: https://www.ksre.k-state.edu/kams/services/mediation/index.html) helps farmers to solve disputes in a peaceful manner. Likewise, the K-State Farm Analyst programme provides educational services to farm families to manage their finances and business planning. Several extension services in USA, Australia, New Zealand, and in Europe conduct capacity building programmes for various clientele in managing stress and preventing suicides. Various academic and continuous education programmes are offered to many stakeholders for farm stress management and suicide prevention. Under this system, the specialised agencies created for farmers’ health management provide integrated services to farmers including counselling, stress and suicide-related education, capacity building, conducting workshops on stress and suicide prevention, conducting research on farmers’ health and safety, and offering certificate courses on farmer health to develop a workforce for grassroots interventions. The National Centre for Farmers Health, Australia (https://www.farmerhealth.org.au/) and Farmstrong programme of New Zealand (https://farmstrong.co.nz/) are a few examples of this approach. Some farmers’ federations like Victorian Farmers Federation, Australia (https://www.vff.org.au/), also provide integrated services for farm stress management. Community-based suicide prevention programmes are aimed to help communities to create interventions/projects to reduce farm stress and prevent self-destructive behaviours and conditions that lead to suicide, and to increase individual, family, and community health. These programmes offer grants, subsidies and bursaries to create infrastructure and facilities to develop competencies in farm stress management and suicide prevention on a community level. They also provide peer support services and counselling services for the community. The Vidarbha Stress and Health Programme (VISHRAM) in Vidarbha region of Maharashtra, India, (http://www.sangath.in/vishram/), the Alaska Suicide Prevention Programme, United States of America (http://dhss.alaska.gov/dbh/Pages/Prevention/programs/suicideprevention/default.aspx) and Project Utshah, an initiative of the Department of Agricultural Journalism, Punjab Agricultural University (PAU), Ludhiana, under National Agricultural Science Fund (NASF) of Indian Council of Agricultural Research (ICAR), New Delhi, are a few examples of community-based intervention models for preventing farmer suicides. Farmers’ suicides are increasingly becoming a public health crisis in India. 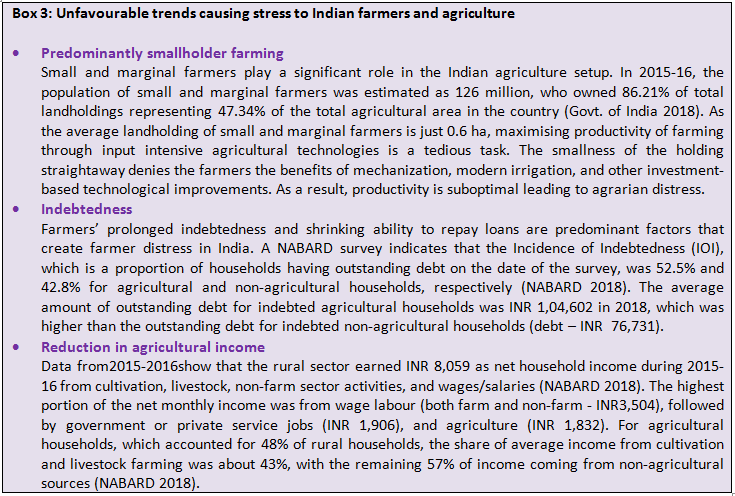 As agriculture is a relatively stressful occupation managed predominantly by small and marginal farmers with smaller operational holdings, stress factors both at the macro and micro levels have a severe impact on farmers’ health. Suicide is not a discrete event caused by a sudden tragedy; it is rather an outcome of long-term accumulation of various stresses over a period of time. A key aspect of any suicide prevention strategy is our ability to understand the suicide process and manipulate the predisposing, protective, and precipitating factors so as to prevent the suicide. As a field-oriented profession directed towards farm households, extension services play a crucial role in preventing farmer suicides – by assisting farmers in understanding the stress and suicide process, identifying vulnerable groups, providing telephonic advice and counselling, creating community-based institutions to educate and help farmers, along with policy changes to help vulnerable groups. To conclude, these are a few strategies for preventing farmers’ suicides in India. American Psychiatric Association (APA). 2003. Practice guidelines for the assessment and treatment of patients with suicidal behaviours. American Journal of Psychiatry, 160(11): 1-60. Andersen K, Hawgood J, Klieve H, Ko˜lves K, De Leo D. 2010. Suicide in selected occupations in Queensland: evidence from the state suicide register. The Australian & New Zealand Journal of Psychiatry, 44:243–249. Anneshi R and Gowda NK. 2015. An Economic Analysis of Rural Indebtedness of Farmer House Holds: A House Hold Study in Davanagere District of Karnataka. Indian Journal of Research, 4(7): 285-287. Beautrais AL. 2018. Farm suicides in New Zealand, 2007–2015: A review of coroners’ records. Australian & New Zealand Journal of Psychiatry, 52(1): 78–86. Beck AT, Steer RA and Ranieri WF. 1988. Scale for suicide ideation: psychometric properties of a self-report version. J Clin Psychol, 44(4):499-505. Behere PB, Behere AP. 2008. Farmers’ suicide in Vidarbha region of Maharashtra state: A myth or reality? Indian J Psychiatry, 50:124-127. Bhise MC and Behere PB. 2016. Risk Factors for Farmers’ Suicides in Central Rural India: Matched Case-control Psychological Autopsy Study. Indian journal of psychological medicine, 38(6): 560-566. Boergers J, Spirito A Donaldson D. 1998. Reasons for adolescent suicide attempts: Associations with psychological functioning. Journal of American Academy of Child and Adolescent Psychiatry, 37: 1287-1293. Booth NJ and Lloyd K. 2000. Stress in farmers. The International Journal of Social Psychiatry, 46: 67-73. Booth NJ, Briscoe M and Powell R. 2000. Suicide in the farming community: Methods used and contact with health services. Occupational & Environmental Medicine, 57: 642-644. Bossard C, Santin G and Canu IG. 2016. Suicide among Farmers in France: Occupational Factors and Recent Trends, Journal of Agromedicine, 21(4): 310-315. Boulanger S, Deaville J, Randall-Smith J and Wynn-Jones J. 1999. Farmer suicide in rural Wales. Newtown, Powys: Institute of Rural Health. Bridge JA, Goldstein TR, and Brent DA. 2006. Adolescent suicide and suicidal behavior. J Child Psychol Psychiatry, 47(3–4):372–394. Bryant L and Garnham B. 2013. Beyond discourses of drought: the micro-politics of the wine industry and the mental health of farmers. Journal of Rural Studies. 32:1-9. Carstens E, and Moberg GP. 2000. Recognizing pain and distress in laboratory animals. ILAR J. 41(2):62–71. Charlton J, Kelly S, Dunnell K, Evans B and Jenkins R. 1993. Suicide deaths in England and Wales: trends in factors associated with suicide deaths. Population Trends, 71:34–42. Consoli A, Peyre H, Speranza M. 2013. Suicidal behaviors in depressed adolescents: Role of perceived relationships in the family. Child Adolesc Psychiatry Ment Health, 7(1):8. Dandekar A and Bhattacharya S. 2017. Lives in Debt: Narratives of Agrarian Distress and Farmer Suicides. Economic and Political Weekly, 52(21): 77-84. Deary IJ, Willock J and Mcgregory M. 1997. Stress in farming. Stress Medicine, 13:131–136. Deshpande RS. 2002. Suicide by farmers in Karnataka: Agrarian distress and possible alleviatory steps, Economic and Political Weekly. 37(26): 2601-2610. Eberhardt BJ and Pooyan A. 1990. 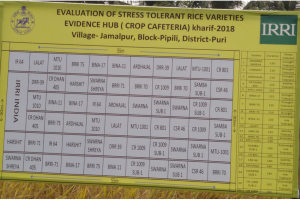 Development of the farm stress survey: factorial structure, reliability, and validity. Educ Psychol Measure. 50:393-402. Eisner CS, Neal RD and Scaife B. 1998. Depression and anxiety in farmers. Prim Care Psychiatry, 4: 101–105. Eskin M, Ertekin K, Dereboy C and Demirkiran F. 2007. Risk factors for and protective factors against adolescent suicidal behavior in Turkey. Crisis, 28: 131-139. Fetsch RJ. 1984. Farm stress series: Farming-a stressful occupation; Stress management for farmers; Stress management for couples; When generations farm together; Farm stress management plan. Cooperative Extension Service Leaflets 283-288. Lexington, KY: University of Kentucky, College of Agriculture. Fragar L, Henderson A, Morton C, Pollock K. 2008. The Mental Health of People on Australian Farms – the Facts. Facts and Figures on Farm Health and Safety Series No. 12. Australian Centre for Agriculture Health and Safety. Fragar L and Franklin R. 2000. The Health and Safety of Australia’s Farming Community: A Report of the National Farm Injury Data Centre for the Farm Safety Joint Research Venture. Moree: Rural Industries Research and Development Corporation and Australian Centre for Agricultural Health and Safety. Fraser CE, Smith KB, Judd F, Humphreys JS, Fragar LJ Henderson A. 2005. Farming and mental health problems and mental illness. The International Journal of Social Psychiatry, 51: 340-349. Gajalakshmi V and Peto R. 2007. Suicide rates in rural Tamil Nadu, South India: Verbal autopsy of 39,000 deaths in 1997-98. Int J Epidemiol, 36:203–207. Gallagher AG and Sheehy NP. 1994. Suicide in rural communities. Journal of Community and Applied Social Psychology, 4: 145–155. Gerrard CE. 1998. Farmers’ occupational health: cause for concern, cause for action. Journal of Advanced Nursing, 28(1): 155–163. Goldberg DP. 1972. The detection of psychiatric illness by questionnaire. London: Oxford University illness by questionnaire. London: Oxford University Press. Govt of India. 2018. Agriculture Census 2015-16. Phase-I: Provisional Results. All India Report on Number and Area of Operational Holdings. New Delhi: Agriculture Census Division, Department Of Agriculture, Co-Operation & Farmers Welfare, Ministry Of Agriculture & Farmers Welfare, Government of India. Grant N, Hamer M, and Steptoe A. 2009. Social isolation and stress-related cardiovascular, lipid, and cortisol responses. Annals of Behavioral Medicine, 37(1):29-37. Gregoire A. 2002. The mental health of farmers. Occupational Medicine, 52:471–476. Hanigan IC, Butler CD, Kokic PN and Hutchinson MF. 2012. Suicide and drought in New South Wales, Australia, 1970–2007. Proc. Natl. Acad. Sci. USA, 109(35):13950-5. Hawton K, Simkin S, Malmberg A. 1998. Suicide and stress in farmers. London: The Stationery Office. Heisel MJ and Flett GL. 2006. The development and initial validation of the Geriatric Suicide Ideation Scale. The American Journal of Geriatric Psychiatry, 14(9): 742-751. Hossain D, Eley R, Coutts J, Gorman D. 2008. Mental health of farmers in Southern Queensland: Issues and support. Aust. J. Rural Health. 16:343–348. Hounsome B, Edward RT, Hounsome N and Edwards-Jones G. 2012. Psychological morbidity of farmers and non-farming population: Results from a UK survey. Community Mental Health Journal, 48: 503-510. ICMR. 2017. National Ethical Guidelines for Biomedical and Health Research Involving Human Participants. New Delhi; Indian Council of Medical Research. Ivanova I. 2018. Farmers in America are facing an economic and mental health crisis. CBS News. Available at: https://www.cbsnews.com/news/american-farmers-rising-suicide-rates-plummeting-incomes/. Accessed on: 20-1-2019. Jacobs D. 1999. Harvard Medical School guide to suicide assessment and intervention. San Francisco: Jossey-Bass. Johnswire. 2018. More than one farmer a week in the UK dies by suicide. Farm Business. Available at: http://www.farmbusiness.co.uk/news/more-then-one-farmer-a-week-in-the-uk-dies-by-suicide-2.html. Accessed on: 20-1-2019. Judd F, Jackson H, Fraser C, Murray G, Robins G and Komiti A. 2006. Understanding suicide in Australian farmers. Social Psychiatry and Psychiatric Epidemiology, 41: 1–10. Kale NM, Mankar DM and Wankhade PP. 2014. Consequences of Farmers Suicide and Suggestions Perceived from Victim’s Households to Prevent Suicides in Vidarbha Region. Global Journal of Science Frontier Research: D Agriculture and Veterinary. 14(10): 43-46. Kearney GD, Rafferty AP, Hendricks LR, Allen DL and Tutor-Marcom R. 2014. A cross-sectional study of stressors among farmers in eastern North Carolina. N C Med J., 75 (6): 384-392. Keating N, Munro B and Doherty M. 1988. Psychosomatic stress among farm men and women. (Pp. 64-73), In R. Marotz-Baden et al. eds., Families in rural America: stress, adaption and revitalizatio , St.Paul, Minnesota: National Council on Family Relations. Kelly S, Charlton J and Jenkins R. 1995. Suicide deaths in England, 1982-92; the contribution of occupation and geography. Population Trends, 80: 16-25. Kennedy AJ, Maple MJ, McKay K, and Brumby SA. 2014. Suicide and accidental death in Australia’s rural farming communities: a review of the literature. Rural Remote Health, 14:2517. Kessler RC, Andrews G, Colpe LI. 2002. Short screening scales to monitor population prevalences and trends in non-specific psychological distress. Psychol Med, 32: 959-976. Kposawa A. 1999. Suicide mortality in the United States: Differentiated by industrial and occupational groups. American Journal of Industrial Medicine, 36: 646–652. Kunde L, Kõlves K, Kelly B, Reddy P and De Leo D. 2017. Pathways to Suicide in Australian Farmers: A Life Chart Analysis. International journal of environmental research and public health, 14(4): 352. Kureshi JS and Somasundaram KV. 2018. Assessment of occupational stress among farmers in Aurangabad district, Maharashtra. Int J Community Med Public Health. 5(4):1434-1440. Lal SP, Kadian KS, Jha SK, Singh SRK, Goyal J, Kumar RS, Singh SP. 2014. A Resilience scale to Measure Farmers’ Suicidal Tendencies in National Calamity Hit Region of India. Curr World Environ 14: 9(3). Law S and Liu P. 2008. Suicide in China: unique demographic patterns and relationship to depressive disorder. Current Psychiatry Reports, 10: 80–86. Lazarus RS and Folkman S. 1984. Stress, Appraisal and Coping, New York: Springer Publishing Co.
Lee MTY, Wong BP, Chow BWY, and McBride-Chang C. 2006. Predictors of suicide ideation and depression in Hong Kong adolescents: Perceptions of academic and family climates. Suicide and Life-Threatening Behavior, 36: 82-96. Lovelock K and Cryer C. 2009. Effective Occupational Health Interventions in Agriculture Summary Report on behalf of the Occupational Health in Agriculture Research Team. Report No. 5 Occupational Health in Agriculture Study, Injury Preventive and Social Medicine, Dunedin School of Medicine, University of Otago, February 2009. Manjunatha AV and Ramappa KB. 2017. Farmers suicides: An All India Study. Agriculture, Development and Rural Transformation Centre Report. Bengaluru: Institute for Social and Economic Change. Mccurdy S and Carroll DJ. 2000. Agricultural injury. American Journal of Industrial Medicine, 38, 463–480. McIntosh WL. 2016. Suicide rates by occupational group—17 states, 2012. Morbidity and Mortality Weekly Report, 65: 641-645. McShane CJ, Quirk F, Swinbourne A. 2016. Development and validation of a work stressor scale for Australian farming families. Aust. J. Rural Health, 24:238–245. Meeta and Rajivlochan. 2006. 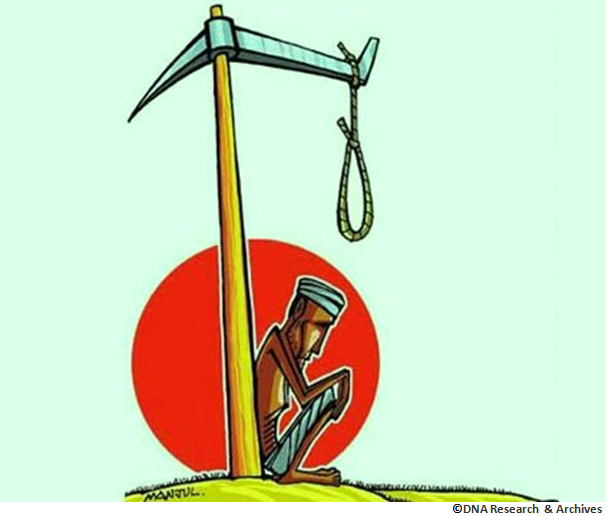 Farmers Suicide: Facts and Possible Policy Interventions. Yashwant rao Chavan Academy of Development Administration. Maharashtra. Meneghel SN, Victora CG, Faria NMX, Carvalho LA, Falk JW. 2004. Características epidemiológicas do suicídio no Rio Grande do Sul. Rev Saude Publica. 38(6):804-810. Miller IW, Norman WH, Bishop SB, and Dow MG. 1986. The Modified Scale for Suicidal Ideation: Reliability and validity. Journal of Consulting and Clinical Psychology, 54(5): 724-725. Miller SD, and Smith DEP. 1985. Differences in literal and inferential comprehension after reading orally and silently. Journal of Educational Psychology, 77(3): 341-348. Milner A, Spittal MJ, Pirkis J, and LaMontagne AD. 2013. Suicide by occupation: systematic review and meta-analysis. British Journal of Psychiatry, 203:409–416. Mohanty BB. 2013. 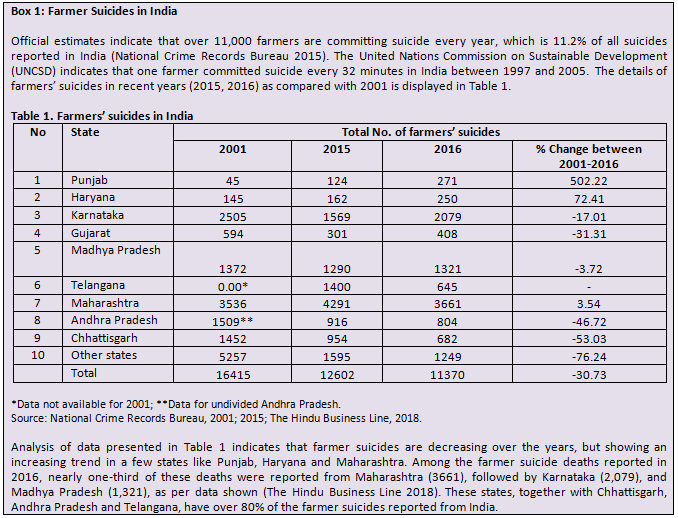 Farmer Suicides in India. Economic & Political Weekly, 48(21): 45-54. Mohanty, BB and Shroff S. 2004. Farmers’ Suicides in Maharashtra. Economic and Political Weekly, 39(52): 5599-5606. Moskos MA, Achilles J and Gray D. 2004. Adolescent suicide myths in the United States. Crisis, 25: 176-182. NABARAD. 2018. NABARD All India Financial Inclusion Survey (NAFIS) 2016-17. Mumbai, India. National Bank for Agriculture and Rural Development. NCRB. 2015. Accidental Deaths & Suicides in India 2015. New Delhi: National Crime Records Bureau. NSC. 2016. Injury facts. National Safety Council. Itasca, Illinois. Nishimura M, Terao T, Soeda S, Nakamura J, Iwata N and Sakamoto K. 2004. Suicide and occupation: Further supportive evidence for their relevance. Progress in Neuro-Psychopharmacology & Biological Psychiatry, 28(1): 83–87. Nock MK, Joiner TE, Gordon KH, Lloyd-Richardson E, and Prinstein MJ. 2006. Non-suicidal self-injury among adolescents: diagnostic correlates and relation to suicide attempts. Psychiatr Res 144:65–72. Page AN and Fragar LR. 2002. Suicide in Australian farming, 1988–1997. Australian & New Zealand Journal of Psychiatry, 36: 81–85. Perceval M, Ross V, Kõlves K, Reddy P, and De Leo D. 2018. Social factors and Australian farmer suicide: a qualitative study. BMC public health, 18(1): 1367. Pickett W, King WD, Faelker T, Lees R, Morrison H and Bienfeld M. 1999. Fatal work-related farm injuries in Canada 1991–1995. Canadian Medical Association Journal, 160: 1843–1848. Pokorny A. (1983). Prediction of Suicide in Psychiatric Patients: Report of a Prospective Study. Archives of general psychiatry. 40: 249-57. Ramesh A and Madhavi C. 2009. Occupational stress among farming people, Annamalal India. J Agricultural Sci. 9: 4:3. RNAO. 2009. Assessment and Care of Adults at Risk for Suicidal Ideation and Behaviour. Toronto, Canada. Registered Nurses’ Association of Ontario. Rudd, M. D., Joiner, T., and Rajab, M. H. 2004. Treating suicidal behavior: An effective, time limited approach. New York: Guilford. Shaffer D and Pfeffer CR. 2001. Practice parameter for the assessment and treatment of children and adolescents with suicidal behavior. Journal of the American Academy of Child & Adolescent Psychiatry, 40(Suppl7): 24S-51S. Sher L. 2006. Alcohol consumption and suicide. QJM: An International Journal of Medicine, 99: 57–61. Simkin S, Hawton K, Fagg J and Malmberg A. 1998. Stress in farmers: a survey of farmers in England and Wales. Occupational and Environmental Medicine, 55(11)L: 729–734. Singh A and Singh J. 2016. Impact of Farmers’ Suicides on Social and Economic Conditions of Victim Households, Economic Affairs, 61(4): 599-607. Terluin B, van Rhenen W, Schaufeli WB and de Haan M. 2004. The Four-Dimensional Symptom Questionnaire (4DSQ): measuring distress and other mental health problems in a working population. Work Stress. 18: 187-207. The Hindu Business Line. 2018. 11,370 farmers committed suicide in 2016, says Minister. March 21, 2018. The Hindu BusinessLine. Available at: https://www.thehindubusinessline.com/economy/macro-economy/11370-farmers-had-committed-suicide-in-2016-says-minister/article23314193.ece. Accessed on 12-1-2019. The Local Ch. 2018. Concerns over high suicide rate among Swiss farmers. The Local Ch. Available at: https://www.thelocal.ch/20181112/concerns-over-high-suicide-rate-among-swiss-farmers. Accessed on: 20-1-2019. Thomas HV, Lewis G, Thomas R, Salmon RL, Chalmers RM, Coleman TJ, Kench SM, Morgan-Capner, P, Meadows D, Sillis M and Softley P. 2003. Mental health of British farmers. Occupational and Environmental Medicine, 60(3): 181–185. US Department Of Labor. 1999 National Census of Fatal Occupational Injuries, 1998. Washington, DC: Department of Labor, Bureau of Labor Statistics. Walker J. 2012. Mental health in the rural sector. A Review. Commissioned by FARMSAFE, New Zealand. Walker J and Walker L. 1995. Farm Stress Assessment Inventory. Newsletter from the Centre for Agricultural Medicine – University of Saskatchewan. July 1995. Wild LG, Flisher AJ and Lombard C. 2004. Suicidal ideation and attempts in adolescents: Associations with depression and six domains of self-esteem. Journal of Adolescence, 27: 611-624. Zigmond AS and Snaith RP. 1983. The hospital anxiety and depression scale. Acta Psychiatrica Scandinavica, 67 (6): 361–370. Dr P Venkatesan, Principal Scientist, National Academy of Agricultural Research Management (NAARM), Rajendranagar, Hyderabad, Telangana (Email: venkatesan@naarm.org.in). 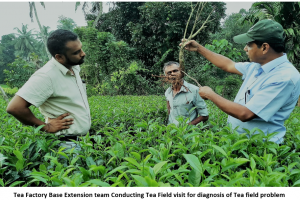 Over the years, role of extension services is witnessing change- from delivering information/transfer of technologies to advising, so rightly now we are using the term Extension & Advisory Services (EAS) or Rural Advisory Services (RAS). The extensionists may find new roles for EAS like coping with stress, emotional support etc with changing times. 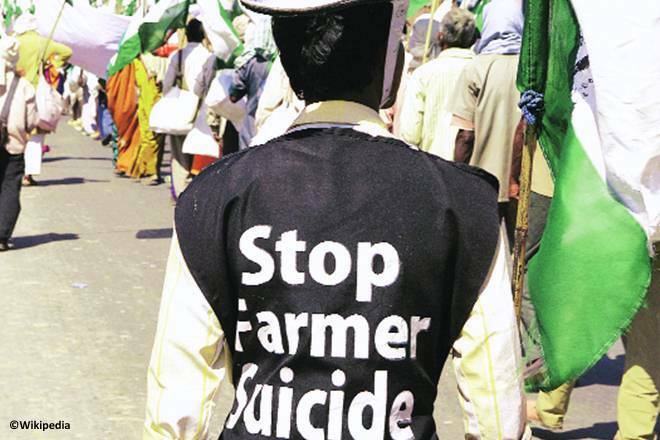 The authors have rightly observed that Extension services should play a crucial role in preventing farmers’ suicides – by assisting them to fathom the stress and suicide process, identifying vulnerable groups, providing telephonic advice and counseling, and creating community-based institutions that can educate and help farmers. Congratulations to Drs Sethuraman & Venkatesan for writing in an area for extensionists which is new and challenging one. Also, congratulations to AESA for bringing out state of art literature, which is contributing to enrichment of the discipline. Wishing 100 blogs to AESA soon!